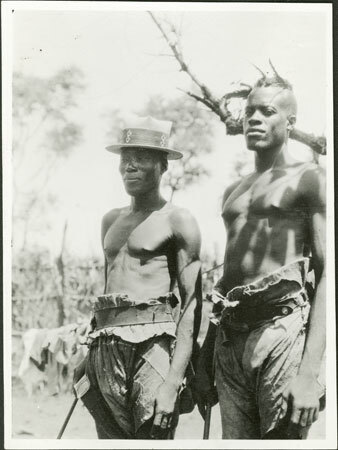 A three-quarter length portrait of two unidentified Zande men wearing barkcloth, one with two feathers in his hair. Morton, Chris. "Two Zande men" Southern Sudan Project (in development). 03 Jan. 2006. Pitt Rivers Museum. <http://southernsudan.prm.ox.ac.uk/details/1998.341.508.2/>.